As I think I’ve mentioned, TD and I spent a couple of weeks in Australia during the second half of May. As I’m sure many people do, we have an ever-lengthening list of places in the world we’d like to go and Australia had been on that list far too long. I also happen to have on my own personal bucket list, with the goal of spending at least one birthday on each continent. Australia made for continent number five. Deciding to go to Australia or sort of like deciding to go to the United States in terms of geographic breadth. Not wanting to spend the two weeks on planes, we chose three cities: Melbourne, Sydney and Port Douglas (an hour outside of Cairns). This meant only two domestic flights and maximized our time on the the ground. As I’ve said at least a million times in previous posts, my favored souveniers come in the form of photos and recipes (or at least inspirations for recipes). We dropped the ball a bit on photos. I’d estimate that at least half of the 50 or so pictures we took are of wallabys and a certain koala we met at an animal sanctuary. Of those, a surprising number happen to be selfies of said koala and TD. Hmm. Luckily, Australians do like their baked goods and sweets. 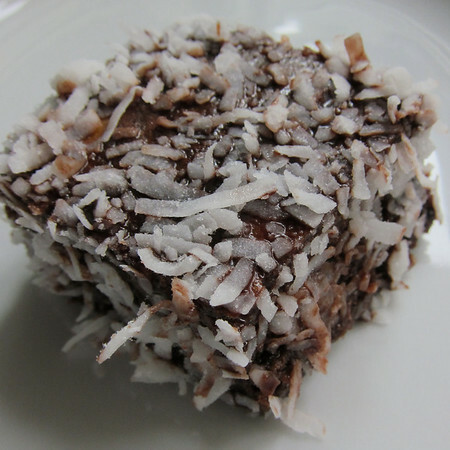 The most famous of which is, the Lamington. This little tea cake is named after either Lord Lamington, the Governor of Queensland from 1896-1901, or his wife, Lady Lamington. Like red velvet cake, the mythology of the treat’s exact origins differs by account. 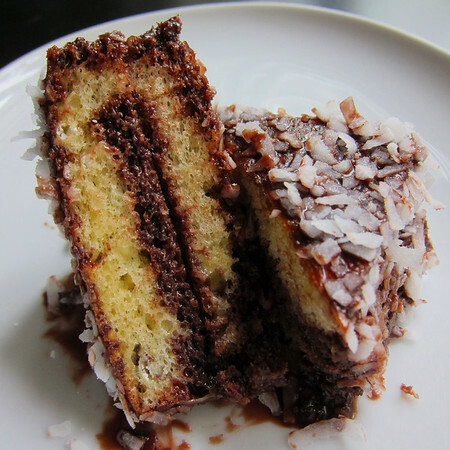 However, the most common story suggests that the yellow cake, dipped in chocolate icing and then rolled in coconut, was developed by the Lamington’s chef when confronted with unexpected guests at tea. Lacking fresh cakes, the chef used the day-old sponge cake and the rest is history. I have an admission, we didn’t have a chance to actually try Lamingtons while in Australia. I know it makes me a poor researcher, but I assumed the cubes of coconut covered confections were giant marshmallows. Oops. It wasn’t until late in the trip that I realized my gaff, and so, I set about rectifying my mistake by making my own. In reviewing recipes, I settled on David Lebovitz’s version. Because, it makes so much sense to make an Australian cake using a recipe from an American living in France. While he was in Australia, he didn’t get to try them either. I think these would be a ton of fun to make with kids. Mostly because they’re incredibly messy. See that unappetizing bowl in the top center of the photo below? That was my hand-wash station. 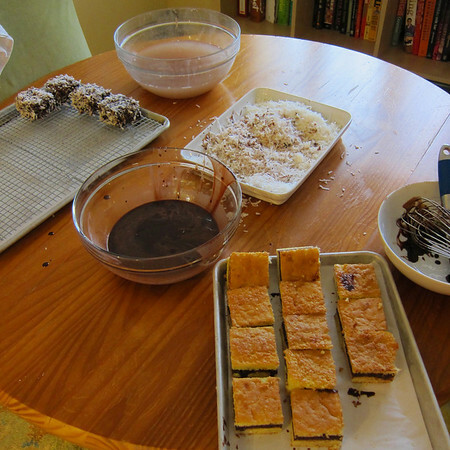 True Lamington form requires one to dip the sandwich cakes in the runny icing (by hand) and then roll them around in the coconut (by hand). Not wanting to get coconut in the icing (in retrospect I have no idea why I was so concerned), I dipped, rolled, set, washed hands, dried and repeated. Sixteen times. I’m pretty sure I lost about a quarter of the icing and coconut to what ended up on me. In the end, it was worth it. The recipe calls for desiccated coconut. I was too lazy to find the desiccated version and went for shredded. The Australians seem pretty okay with variation (in fact, they seem pretty okay with just about anything), so I don’t think they’d mind. These reminded me of something Little Debbie would make. In a good way. Little Lamington does have a certain ring to it. Now, consider yourselves warned. By my count, I’ve got six more Australia-related posts in the pipeline. Next week we’ll take a little break for some Fourth of July fun but after that it’s back to my version of boring vacation slides. And one more thing. Well done Bruins Baseball! If my math is correct, that’s 109 championships, a first for baseball and about a million 8-claps. 1. 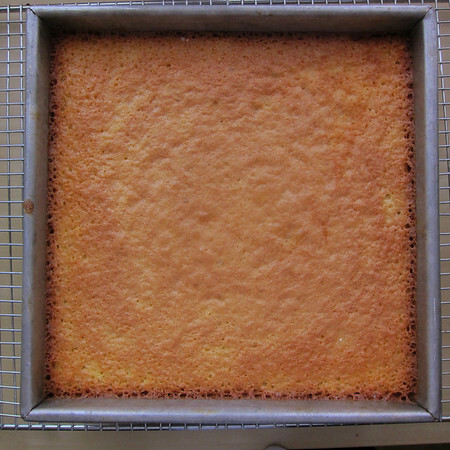 To make the spongecake, butter a 9-inch (23 cm) square cake pan and line the bottom with parchment paper. Preheat the oven to 350ºF (180ºC). 2. 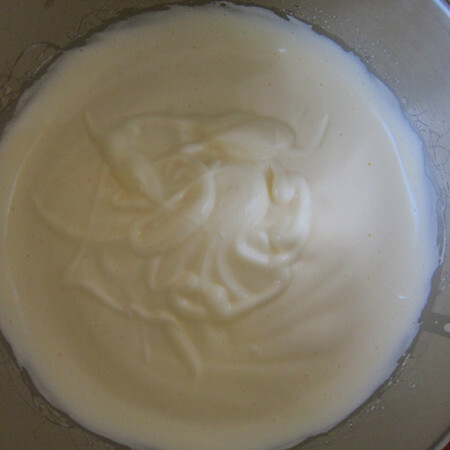 In the bowl of a stand mixer, whip the eggs and granulated sugar and salt on high speed for five to ten minutes, until thick and the batter forms a well-defined ribbon that remains on top of the batter when you lift the whip. Stir in the vanilla. 3. 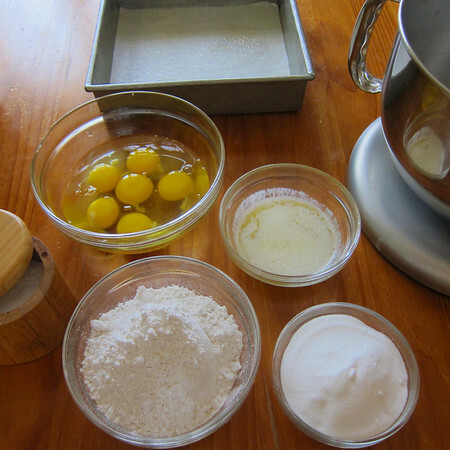 Fold the flour into the egg mixture by putting the flour in a sifter or mesh strainer and sifting the flour over the top of the beaten eggs while simultaneously folding the flour in using a whisk. (You might want to steady the bowl on a damp towel, twisted and rolled up into a circle, or get someone to hold the bowl while you fold.) Fold in the melted butter until no streaks of butter are visible, but do not overfold. 4. Scrape the batter into the prepared pan and bake for 30 minutes, or until the cake begins to pull away from the sides of the pan. Remove from oven and let cool completely. 5. 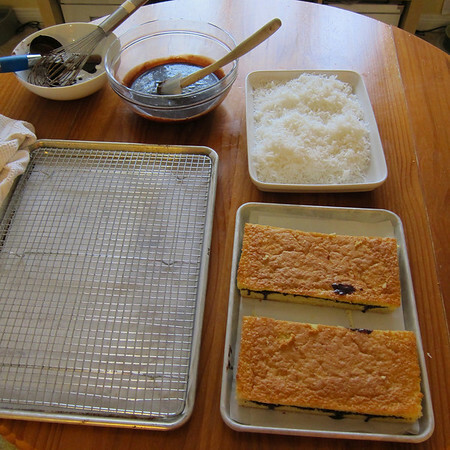 When cool, unmold the spongecake onto a cutting board and remove the parchment paper. TMH note: since the origins of the cake involved day-old sponge, I wrapped up the cake tightly and froze it over night for ease in cutting. And authenticity. 7. 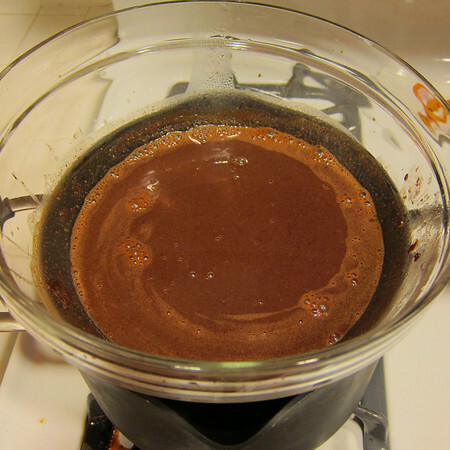 Make the chocolate icing by melting together the chocolate, butter, and milk in a heatproof bowl set over a pan of simmering water. 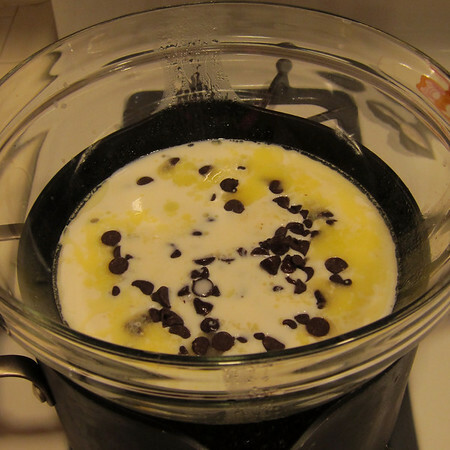 Remove the bowl from the pan of simmering water when smooth, then whisk in the powdered sugar and cocoa powder. 8. Spread a generous 1/2 cup (125 ml) of the chocolate icing over one layer of the spongecake, then top with the other half of the spongecake, sandwiching the two together with chocolate icing in the middle. 9. Cut the cakes into sixteen squares. 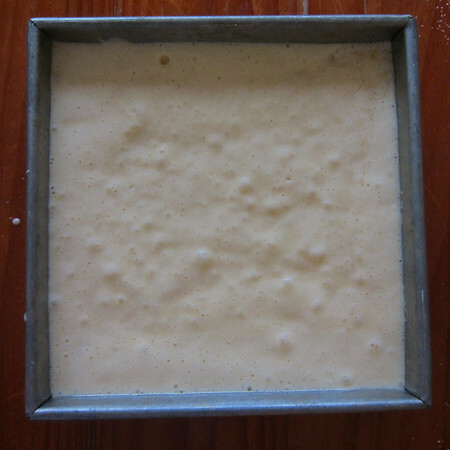 TMH note: I was worried about the two halves sliding around during the dipping process and so, arranged the squares on a 1/4 baking sheet and put them in the freezer for 30 minutes to encourage the icing to form a stronger glue. It worked as I can report no slippage. 10. Whisk two tablespoons of boiling water into the icing. Put the coconut into a shallow baking dish or bowl. 11. Use your hands to dip the Lamingtons into the chocolate, rolling them around to make sure each side is coated with the chocolate icing, then wipe off any excess on the side of the bowl. 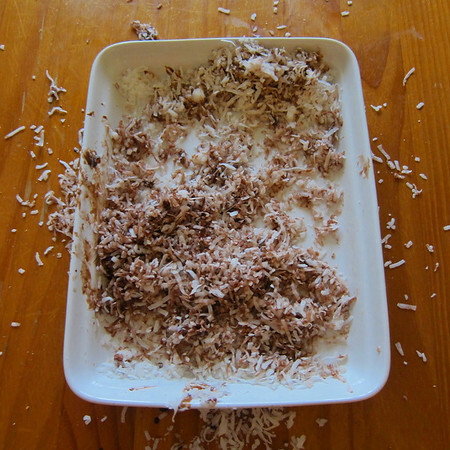 Place the Lamingtons in the vessel of coconut, tossing them around gently to get them coated on all sides. 12. Once iced and tossed in coconut, place the Lamingtons on a wire cooling rack and let stand until the icing firms up a bit. Thanks for clearing up the mystery of Lamingtons. I can’t wait to read more about Aussie confectionery!